Our LG has always immediately gravitated towards whatever she isn’t “supposed” to have. Keeping up with her is an even bigger challenge now that she’s crawling! She really loves buckles, ribbons, wires, ties, etc. Really anything that could become a strangulation hazard! 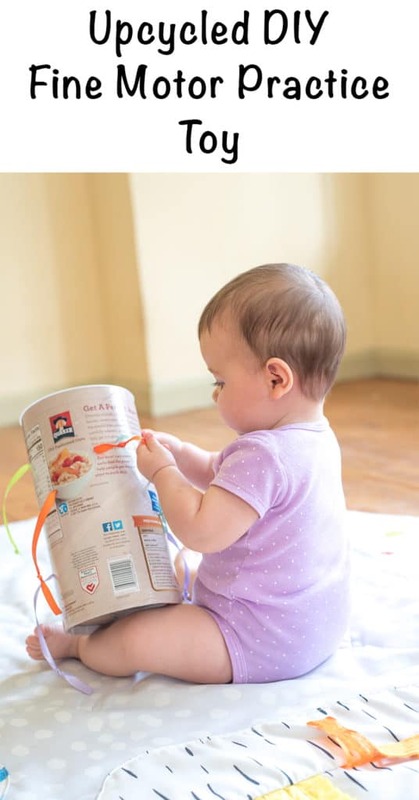 Lately she’s also been really enjoying an empty oatmeal container, so I decided to make her an upcycled DIY fine motor toy that combines bright colors with the allure of the forbidden. Please don’t tell her that I made sure all the ribbons are too short to be hazardous! This toy is super easy to make! 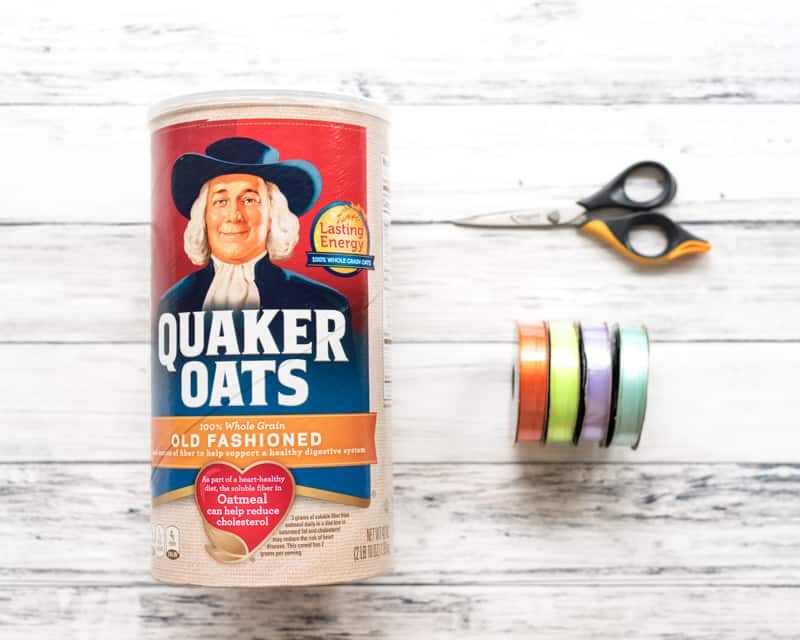 We usually buy store brand oatmeal when it’s in stock, but I know LG really likes the brightly colored Quaker box and the cardboard is a bit thicker than many store brands I’ve encountered. I did not decorate the container because I know our girl is drawn to its un-decorated appearance. 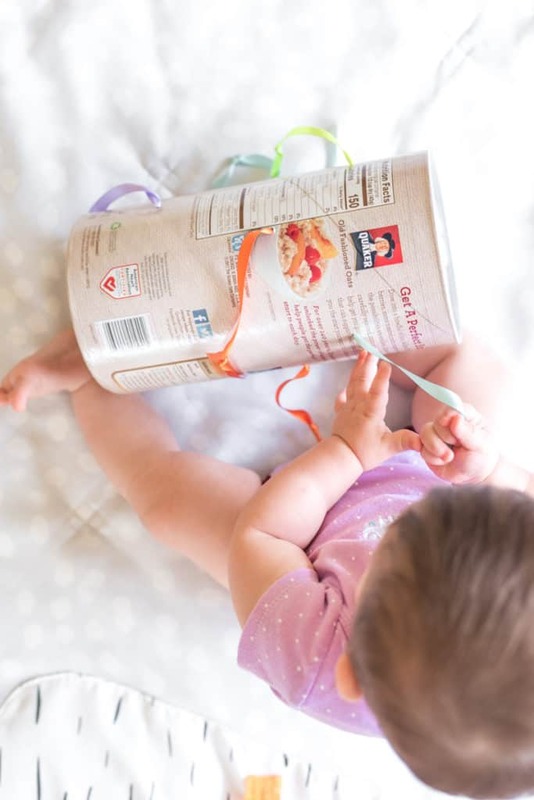 You could paint your oatmeal container with a certified nontoxic paint if you’d prefer. An empty oatmeal container, box, or something similar and food-grade cardboard. A pair of scissors with pointy ends, a small awl, a large nail, or something else to poke holes with. Ribbons. I used a variety of 1/4″ ribbons, some smooth and others with texture. A lighter. Optional but helpful to prevent fraying if you use synthetic ribbons. 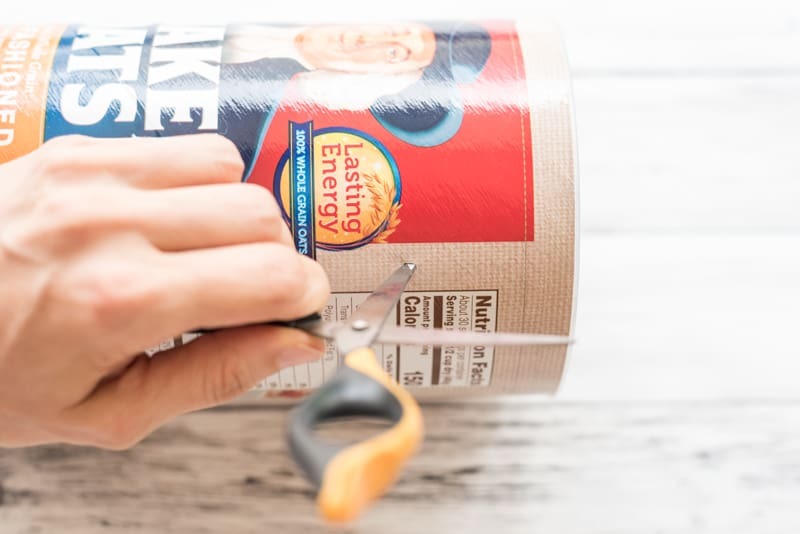 Use your scissors, awl, or other tool to very carefully poke holes in your cardboard container. Make them just large enough to slip a ribbon though. I used a single blade from a smallish pair of scissors to stab a small slit – don’t create a giant hole or the ribbons will pull right through. Poke one hole for each of your ribbons. If you’d like, singe the ribbon ends to help prevent fraying. Tie a knot in one end of each ribbon. One by one, thread the ribbons through a pre-cut hole, then knot the opposite end. 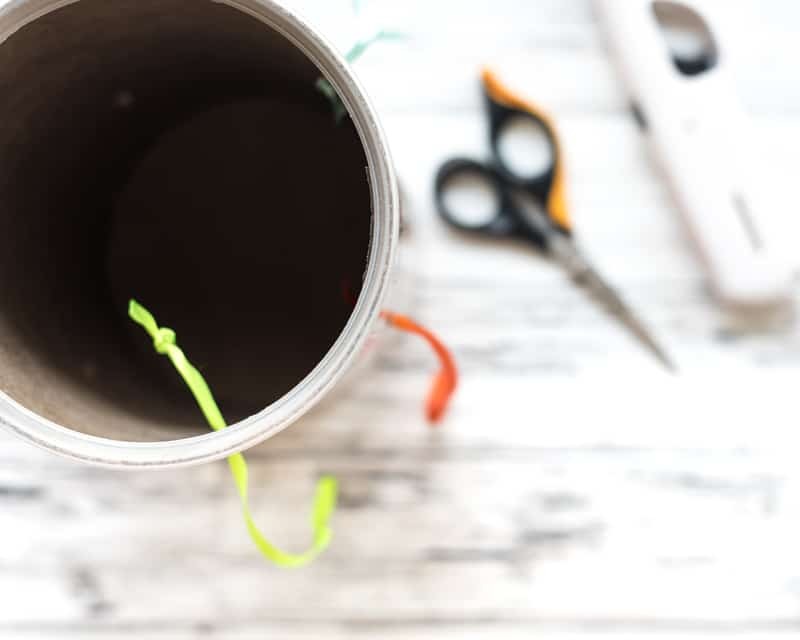 It can be really tricky to the the knot inside the container, so I recommend threading from the inside out (so that the pre-tied knot is inside the container and you’re tying the second knot on the outside). Test your ribbons to make sure they can’t escape through the holes. If they can, tie a second knot on top of the first to make it more bulky. Hand over the toy and watch your baby enjoy! As with any toy, please make sure to directly supervise your little one while they use it. Even though I made this a little while ago, this upcycled toy is still out on LG’s shelves and she still likes to play with it! Though, honestly, all of her toys have recently taken a back seat to cruising and crawling away from us at top speed! I feel like she’s going to be walking way sooner than any of us are ready for. 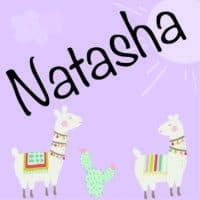 Looking for another handmade toy idea? This wood bead clutch toy is super easy to make! 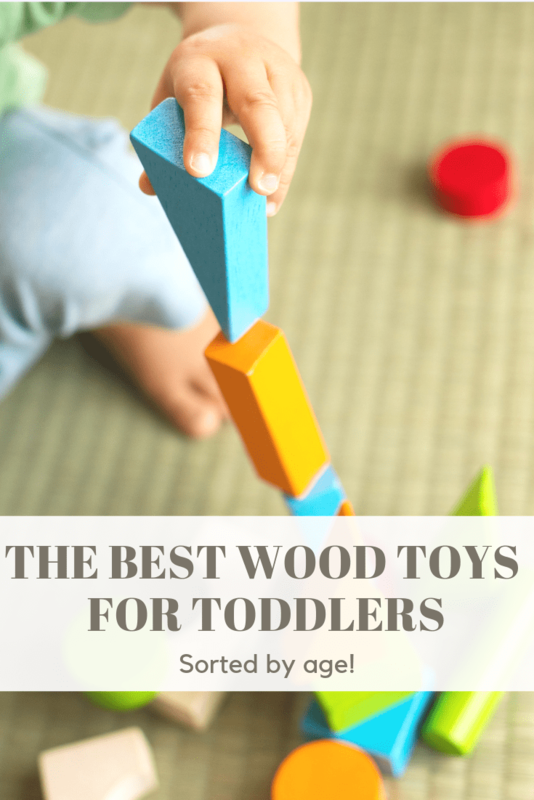 For older infants and young toddlers, check out this collection of best non-toxic wood toys! Have you ever made upcycled toys or used non-toy items as toys? How about not cutting your ribbon until it is secured on the inside. That way there should be plenty of length to knot it, THEN cut to desired length. Makes life easier. That’s a good idea! I was really concerned with cutting my ribbons to an exact length to make sure they were short enough, but it certainly would be easier to cut the ribbons after threading them through the holes. I can be very poor at estimating length/distance, but I’m sure most people would be able to cut the ribbons short enough by eyeballing it! Love this idea!! Tommy is also drawn to all things forbidden. 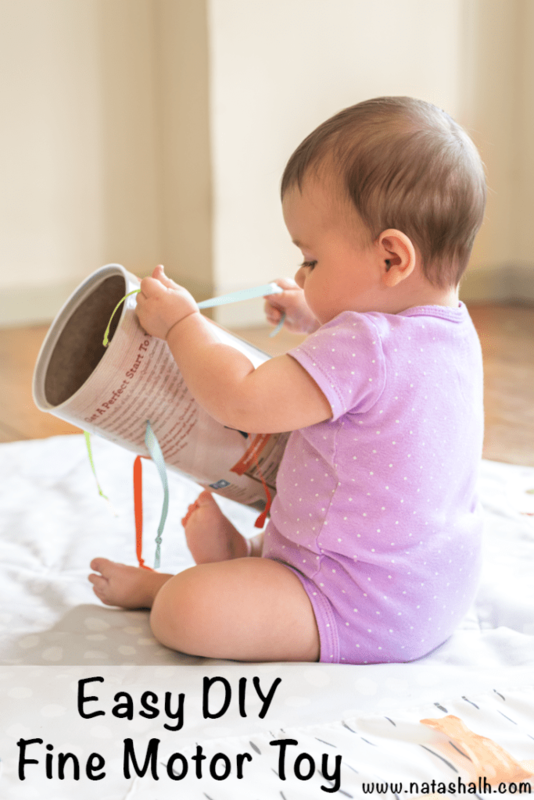 Nine times out of ten, he’d rather play with an empty oatmeal container than a traditional toy, so why not make the oatmeal container more engaging? I’m glad to know it isn’t just our girl! It seems like she only has eyes for the things she isn’t supposed to have!